For someone not from Melbourne, Australian Rules football can look confusing and all over the place - not quiet like any other sport! When we came to Melbourne, we tried to work out the rules by watching, but could not quite get it. We did not understand what really caused the umpire to break up a pile of bodies, why a free kick... So, here it is all explained. You can also go to a game with a live local 'footy' guide, when taking an Australian Aussie Rules Football Tour. He will walk you through experience and explain the rules, bumps and brawls of this unique game. 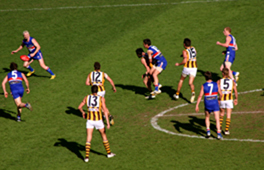 Australian Rules football is also known as Aussie rules or"footy". It is a uniquely Australian contact sport, in fact the first form of football ever to be codified in 1858. It's original purpose was to keep Cricketers fit during winter. The Australian football league (AFL) is it's the central Australian footy competition played throughout winter. It is a fast moving game with fit learner players than in Rugby League. 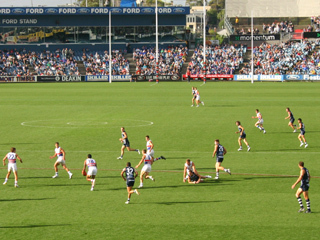 It is played with an oval ball on a large oval field. Because of the ball's shape, you never know which way it will bounce, making the game more random. The objective of the game is to score points by kicking the ball between any of the four posts at the opponent's end. A kick between the two middle posts scores 6 points. A kick between a side post and middle post scores 1 point; this is called a behind. The game is played over 4 quarters of 20 minutes. The team with the highest score wins. Each team has 22 players, 18 of which are on the field at a time. Players can move anywhere on the ground, although they have designated positions. These are Full Forwards, Half Forwards, Centre Line, Half Back and Full Back. The ball can be advanced either through kicking, hand passing, or by running with the ball. Hand passing involves hitting the ball with the fist - throwing is not allowed. When running, a player must bounce the ball every 15 metres - not an easy task with the odd shaped ball. The fun of Australian Rules football comes from being a contact sport. A player can bump any opponent who is within 5 metres of the ball, which adds to the excitement. A bump is contact made from the side by hip or shoulder. It is used to prevent the other player from gaining possession of the ball. Furthermore, the ball can be snatched off an opponent any time. This is called a tackle. It often involves wrestling the other player to the ground - this gets spectacular in wet muddy conditions. If a player is tackled he has to pass on the ball immediately. The only time a player cannot be tackled is when hes got a free kick. A player gets a free kick by getting a mark - catching the ball from a kick that was further than 15 metres. Free kicks are also given when a player violates a playing rule or gets too rough. Here is a full list of footy rules. An aerial mark is called a spectacular mark or specky. While going for a mark, a player jumps up on the back of another player, resulting in spectacular catches in mid air - and falls. As you see, Aussie Rules is an exciting fast moving game and great spectator sport with enthusiastic fans adding to a passionate atmosphere.